Contractors Association on October 2, 2018, in Philadelphia. Celebrating the trade agreement he orchestrated amid weeks of otherwise dour news, President Trump used a visit to Philadelphia on Tuesday to boast of a booming economy and a nation rebounding from decades of mistreatment at the hands of trading partners around the world. "This is an incredible time for our nation. 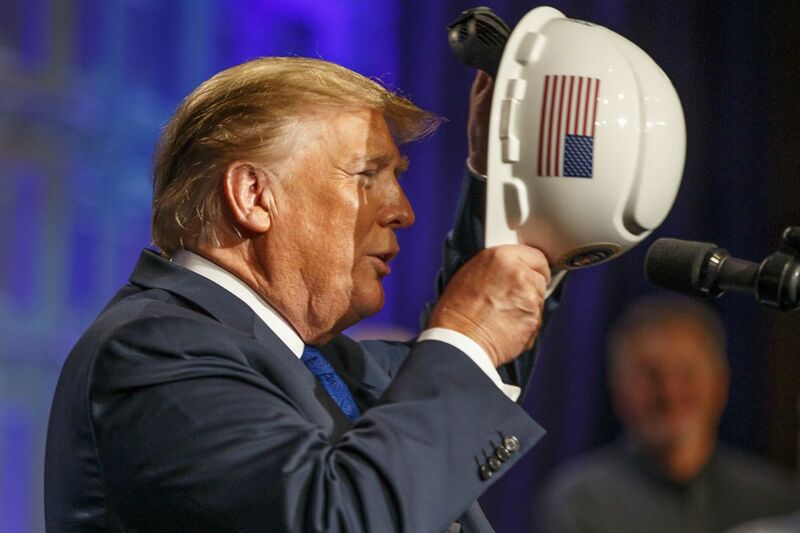 We are respected again like we have not been respected in decades," Trump told the National Electrical Contractors Association, gathered at the Convention Center for its annual meeting. "We have the best economy in our history." The president praised the pact his administration struck with Canada and Mexico, finalized on Monday, that he said will protect U.S. workers and increase the nation's agricultural exports. He called it the "most advanced, modern, and balanced trade agreement ever." And, with an eye toward the 2020 presidential election, Trump said "jobless claims are at a 50-year low" and "African Americans', Hispanic Americans', and Asian Americans' unemployment rates have all recently reached their lowest levels ever recorded." "That's pretty good," Trump said. "That's a very hard sound bite to beat if you're an opponent of Trump." President Donald Trump addresses the members of the National Electrical Contractors Association, with some of them on stage with him, at the Pennsylvania Convention Center on October 2, 2018. Speaking for about 38 minutes to a mostly polite crowd, the president avoided the swirling controversies he left behind in Washington, including the intense political battle over in his nomination of Judge Brett Kavanaugh to the U.S. Supreme Court, the continuing investigation into Russian interference in the 2016 presidential election, and growing concern about a midterm election backlash that could help Democrats seize control of Congress. Instead, he pitched himself as a businessman-turned-politician who has filled contractors' pockets with "so much money." He paused three times in his speech to call to the podium people who work in electrical contracting, where they praised the president and his policies. Leam Nicholaides, an apprentice for Local 98 of the International Brotherhood of Electrical Workers in Philadelphia, drew laughter and applause from the crowd, joking about his "pretty easy schedule" of delivering "a speech before a couple thousand people and the president of the United States." Steve Gianatti of Ridgewood, N.Y., said his 120-employee firm will add 30 more workers next year, thanks to Trump's economic and regulatory policies. Stacy Wilson of Canby, Ore., said her family-owned company "employs about 500 employees and thanks to Mr. Trump and the tax reform, and the general confidence in the economy, I guess, we have really been able to invest in our employees and grow our company in the last year." The crowd of about 6,000 stayed seated and mostly quiet throughout, applauding or cheering when he mentioned issues that affect their bottom line. Outside the Convention Center, the visit drew some protesters. As Trump spoke, about 125 people sat down in the middle of Broad Street near its intersection with Cherry Street. "[We're] just here to take up a lot of physical space out here and be a visible force against the Trump administration," said Brian Wilson, with a small group organized by Philly Socialists. Inside, the visit wasn't completely devoid of campaign politics. U.S. Rep. Lou Barletta, a four-term Republican from Hazleton and close political ally of the president, attended. And Trump gave Barletta, who is challenging Sen. Bob Casey's bid for a third term, a shout-out from the stage, telling the crowd: "I'll tell you what, if he is your next senator you're going to have no more problems. He is a doer." NECA endorsed Barletta in August and has given him $29,000 in campaign donations since 2012, according to federal records. Trump was the first president to address the trade group in its 117-year history. NECA describes itself as "the voice of the $160 billion electrical construction industry" with 119 local chapters across the country. The group's convention, which started Friday and concludes Tuesday, drew about 8,000 visitors to Philadelphia. "It was actually inspiring," said Donnie Walker after Trump's speech. Walker, the owner of a technology contracting company in Grass Valley, Calif., said Trump has "a lot of plans for workers and putting people to work. It's as simple as that." Walker and firm co-owner Angel McDonald said they both voted for Trump in 2016 and plan to do so again in 2020. "He's a good talker," McDonald said. "He's very straightforward. His heart is where it needs to be: with our country and the workers." Staff writer Joseph N. DiStefano contributed to this article.